I received this from Scribe UK in exchange for an honest review. As always, my reviews are fair and non-bias. 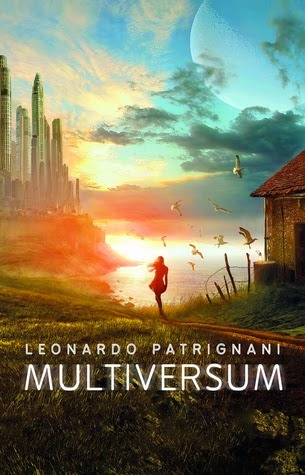 When I was first introduced to Multiversum, I was so thrilled to get the chance to read a translated YA novel from Italian - not to mention how the genre plays right into my favourite things to read - so I couldn't wait to get started reading. Multiversum opens right up into the world of Alex and Jenny, seemingly ordinary teenagers if it wasn't for the fact that they could communicate in random moments telepathically, their voices intertwining in each others minds at any given moment. Although they can just barely utter a few words through these moments together - the far from nice experiences - one time, they manage to exchange their locations and place of meeting, and from there, it takes Alex and Jenny on a roller-coaster of an adventure neither of them were expecting. Alex is just your regular teenager from Milan. He likes sports, particularly basketball - and is even team Captain - and spends his nights hanging out with his best friend. Jenny is like Alex too, a champion swimmer and smart student from Melbourne. But when they try to meet, a disaster strikes when they discover that in each others worlds, Jenny has died in Alex's and in her world, Alex is someone different. Now startled with this evidence and the constant struggle of trying to reach each other through the Multiverse with no one believing their claims of knowing each other and discovery of living in different dimensions, everything they know and are begins to shatter beneath them. Multiversum is quite a page-turner, and although in places I got a little lost within their complex world, it was an addictive read. Alex and Jenny are lively and play off each other amazingly and I loved their relationship - the friendship and romantic element - and their story was very compelling. The different dimensions that they lived in was a highlight of the book for me, particularly because it was a unique, enthralling addition to their story unlike any books similar. Overall, Multiversum is not to be missed for Fantasy fans who want a little extra spark in their novels. A brilliant, read-worthy novel that I'm extremely looking forward to continuing in the series! I loved how Multiversum began and even though the endings are usually my favourite parts like cliff-hangers and happy endings, the introduction to their worlds was by far my favourite. YA Fantasy, Dystopian or Science Fiction fans will love this without a doubt, especially if you're looking for something different. This sounds awesome and I am totally in love with this cover. I need to add this to my TBR!